Back from a week of Decorating! Or I LOVE our bedroom now. W and I have slept in almost all of the rooms you could use as bedrooms since he bought this house, back in 2002. For the first two years we were only here on weekends, and our room was the tiny boxroom I now use as a workroom/office. 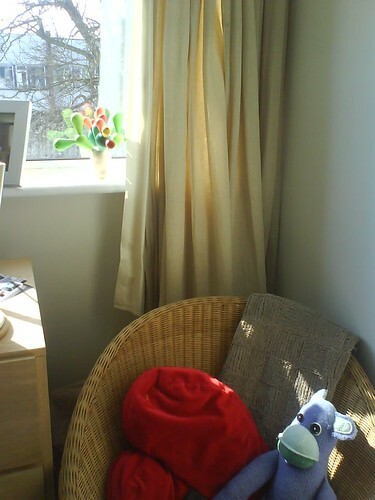 Then when we moved here full-time, we had the bedroom downstairs, which we painted a soft turquoise. Eventually – not long before we got married, in 2005, (when all the other housemates moved out) we FINALLY moved into the master bedroom, and there we have stayed. 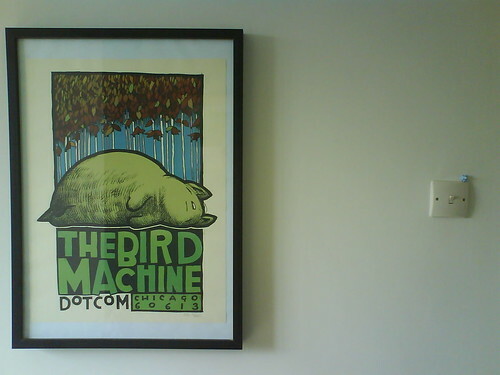 I’m pretty sure that the day we moved in, I announced that we needed to decorate. And – TWO AND A HALF YEARS LATER – we have! It’s not that i didn’t like the colour. Oh wait… no it IS that i didn’t like the particular colour. I like green. I like green alot (which is hilarious when you know that one of my best friends HATES green with a passion). I just didn’t like that green. It was too dark, too opressive. Housemate!J had already put her stamp on the room by painting two of the walls cream, but all the paintwork was a dirty apple-white colour, and overall the room just didn’t work. 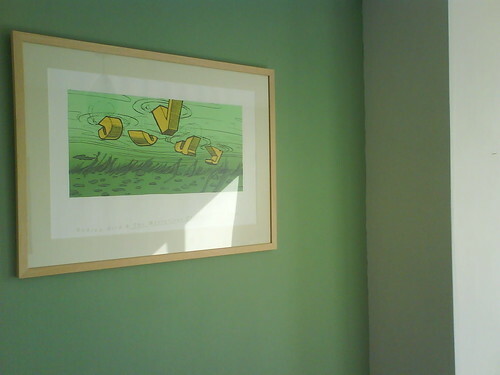 So we made it not work even more, by mis-picking colours, and daubing them on the walls. THAT has been the view from my pillow for two years. The tester squares are gone, and the dark green is now ‘antique’ cream. Much airer! 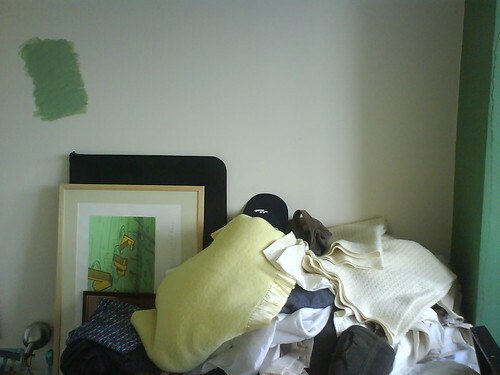 This is the opposite wall, (as it was). And this is the other side of the same chimney pillar. Urgh. 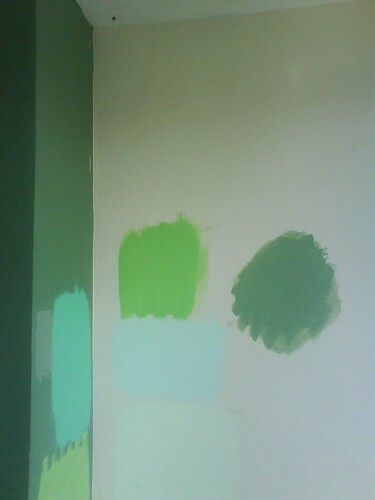 And this is what it looks like now: yes, basically I used a softer green (though the camera phone, and then time of day, makes it look darker than it is), and switched the colours of all (but one) wall. So everything that was green is now cream. (THREE coats, of breathable crown paint). And all that was cream is now green. (Apart from that one wall by the wardrobe – because that would look weird.) The woodwork is all white silk emulsion. (Though I think W is right – It will need a proper gloss, but that’s not going to happen for the next year or so.) And the inside of the wardrobe is a soft velvety purple. this is a test. did it work? Looking very lovely – I love your photos and i think it looks like a haven of tranquillity and calm. I like the colours – they work really well with the pictures and lovely things in your bedroom. I’m always surprised how much I do like colour in rooms – I usually tend to think that neutral white/magnolia is good for showing rooms off but having lived in rented accommodation so long I do have the yearning now and again to add the odd colour splash! i hated living in magnolia rooms – i think it makes you have to work so much harder to pull a room together. 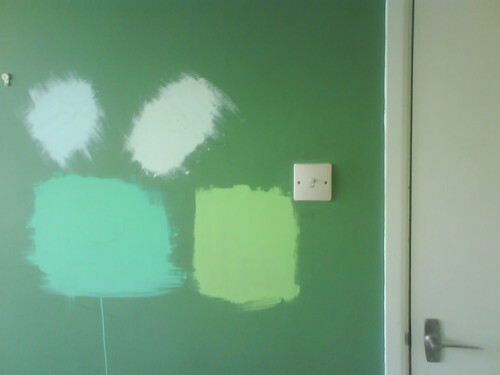 i love that we can paint our walls bright colours! The colour goes fabulously with the artwork. I’m very much looking forward to see what you do with the purple. Also, details on the artwork, please? I want to steal. I went to find the post about the posters, and realised that all the images were still linking to the dead typepad ones, rather than flickr. however, i hunted out the original shots (i think) and updated the page. which you can find here. Nope. But came to check anyway. Also! I now want the one with the kinnitng alligator.